The fattest holiday of the year is over, which means it is time to get back on track with my healthy diet! I don’t even mean diet as in starve myself, just eat healthier foods and cut out junk food… although the second part is going very well in all honesty. EAT COBB: Egg. Avocado. Tomato. Chicken. Onion. Blue Cheese. Bacon. I make mine a little different based on personal taste preference. 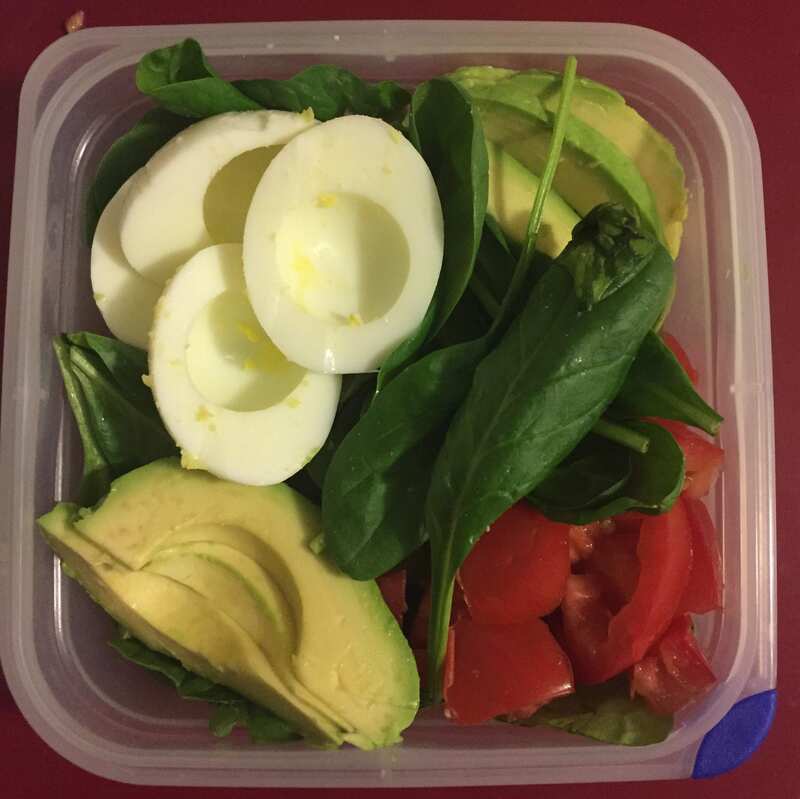 I use spinach, hard-boiled eggs, avocado, tomatoes (sometimes), and usually salmon, but sometimes I will switch it out with chicken or shrimp. The basics are all relatively the same though. My go-to dressings are the Feast from the East Sesame Dressing and I’ve recently been a fan of Balsamic Vinaigrette. Cooking salmon: I’ve struggled with finding the perfect time and temperature to bake. It took a lot of trial and error, but this is what I’ve learned: if a small filet (fist size) is fully defrosted, 12-15 mins at 400°F is good. I always wrap mine in foil but I don’t know if it makes a difference or not. A simple salt and pepper does the trick, add a zest of lemon if you have it. My roomy recently suggested a garlic & herb seasoning, so I do that too sometimes, but it’s not ideal for my salad. 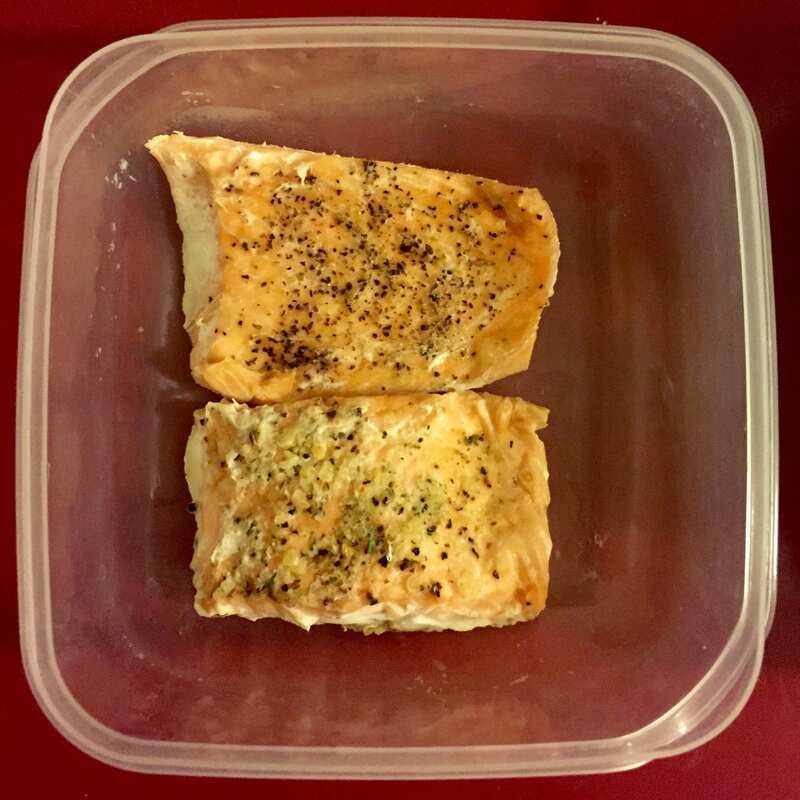 My very first time baking salmon, I baked at 325°F for 20 mins based on another blogger, but that went terribly wrong. I ended up leaving it in the oven for a good 45 mins. Still tasted good in the end. But my salmon wasn’t fully defrosted to start with… so that’s probably my fault. I used to pan fry my salmon which only took 10 mins and it’s easier to monitor, but I like baking it more so I don’t have to worry about it and can focus my attention to other things. & baking it won’t get the smell and smoke everywhere in your kitchen, and seeing how our apartment doesn’t have an actual vent in kitchen… baking is my better option.